It is fast approaching the end of October and I came to the realisation that I still have so many pinks I want to feature for Breast Cancer Awareness Month, especially the China Glaze Fight Like a Woman polishes I hauled! I have a busy week coming up (exam time!! *cries*) so there was going to be no way I could feature all the polishes individually by Sunday. Then I saw this lovely “super pink” mani by Katrina from Katrina's blog and I just knew I had to try it. It is so pretty and kawaii! I got my 1st Nail Up! mag the other week and have been meaning to try out a look like this but never got around to it. I took some inspiration also from WAH nails as they are the experts of this style and they are just so so cool. Here’s my "pinktacular manicure"! China Glaze Endurance - a gorgeous pinky/red jelly with glass flecks through it. China Glaze Encouragement - a baby pink with silver shimmer through it. Very subtle, classy and oh so pretty! China Glaze Empowerment - candy pink creme which is a little streaky to apply so I’d recommend thin coats. BYS Pink with a Punch - a super bright pink that is so pigmented that only 1 coat is needed – awesome. Ulta 3 Party Shoes - which is a gorgeous hot pink from Ulta 3’s latest range I believe. I absolutely love pinks like this! Visee RO 602 - a pretty red and silver glitter! Thumb: 2 coats of China Glaze Endurance with silver and pink rhinestones and heart dazzlings. Index finger: 2 coats of China Glaze Encouragement with Visee RO 602 red glitter applied on the top half of the nail. I kept stuffing this nail up and in the end I went with a lazy persons gradient haha. I’ll definitely be trying out a proper gradient mani soon! Even though this nail gave me the most trouble I ended up liking it the most. Middle finger: 1 coat of BYS Pink with a Punch with pink rhinestones. My 1st attempt at half moons! It wasn’t actually as difficult as I thought it would be which is nice. Plus the rhinestones helped cover up the dodgy edge! Ring finger: 2 coats of China Glaze Empowerment and Kiss nail art striper in white to apply diagonal stripes. Pinky: Ulta 3 Party Shoes applied on the tip and Kiss nail art striper in silver glitter applied on the smile line. Pinky: 2 coats of Ulta 3 Party Shoes with Kiss nail art striper in black for the vertical stripes. Ring finger: 2 coats of China Glaze Endurance with CM Nail Art gold glitter striper applied for the (rather dodgy) half moon. Middle finger: 2 coats of China Glaze Encouragement with a thick stripe of BYS Pink with a Punch down the middle and silver rhinestones. Index finger: 2 coats of China Glaze Empowerment with Pink Fin floral nail sticker. Thumb: 1 coat of BYS Pink with a Punch applied to the tip with Kiss nail art striper in white and silver glitter applied to the smile line. Which is your favourite design? Thanks for looking! Don't forget to enter my Polished Pink for October giveaway here. Ooooh I love this, it's so original!! I thought at first that having all your nails with a different nail art would look weird, but youdefinitely proved me wrong! Very cute Chelle and SUPER Kawaii! this is AMAZING! nice work! seriously this is beautiful! @Bella: Thank you for your kind comment! @Lolaa: Yes I thought so too before but different nail art on each finger is very big in Japan! And the WAH nail manis are just stunning. I'm so glad you like it! @Jennifer: I'm so glad you like them! You can never go wrong with pink nails I think. This is so pretty!! <3 Love it! Pink explosion! I seen Katrina's post as well. It was blingy Japanese nail art that got my whole nail polish obsession started so still loving bling~ haha! Ooooh that is adorable and so original! Pinktacular--I love it! I think my favorites are the candy stripes and the "lazy" glitter gradient, though I keep changing my mind. I love this! This is too cute!!!!! making each nail different is ALWAYS a good option. these are super cute!! I just bought ChG encouragement and I cant wait for it to arrive! :D love love the mani 'chelle. @Annkiins: That design really grew on me as the days went by! It reminded me of candy too. @Donna: My workmates loved it but think I'm insane for spending so much time on my nails haha. Yeah bling nails are awesome!! The Japanese do nails like no other seriously. @Just Cake Girl & Gaby: Thank you so much ladies! @KarenD: I had no idea what to name this mani so my sis came up with the name hehe. I really liked the candy stripes after a while myself! @rins: You can never go wrong with a coloured french tip I think , especially if it includes glitter! @Alice: Awww thank you Alice! @M: So happy you like it! @Monika: Yes I know you love pinks! 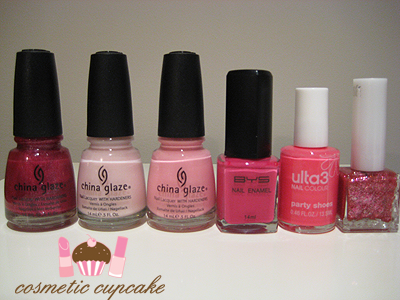 =) I have more pink polishes than any other colour hehe. I really liked doing the different designs so I think I'll be doing more in the future! @nikki: You are very kind Nikki! I think you will really like Encouragement, it's such a pretty polish. I'm not the hugest fan of pink but I swear, all the bloggers doing pink for BCA are converting me! I really adore how each nail is so incredibly unique but there's still a sense of unity in the design; nothing looks out of place. Hard to pick a favourite but I think I like the designs on both your index fingers the most. @Danielle: I'm glad we could convert you to pink Danielle! It is one of my favourite colors along with purple. That was what I was aiming for so it's lovely to hear that you think that! I could comment all your posts, I'm in love with all your nail arts ! Your so imaginative, thanks for making us dream !